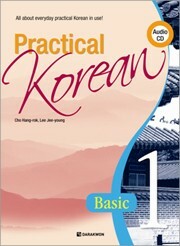 Produktinformationen "Practical Korean 1 Basic - Set mit Workbook and Audio CD"
‘Practical Korean’ series aims to enable beginners to engage in practical conversations and to develop basic communication skills. As the second volume of the ‘Practical Korean’ series ‘Practical Korean 2’ focuses on the essential vocabulary words, grammar structures, tasks, and topics at a basic level. Weiterführende Links zu "Practical Korean 1 Basic - Set mit Workbook and Audio CD"
Unser Kommentar zu "Practical Korean 1 Basic - Set mit Workbook and Audio CD"
Kundenbewertungen für "Practical Korean 1 Basic - Set mit Workbook and Audio CD"